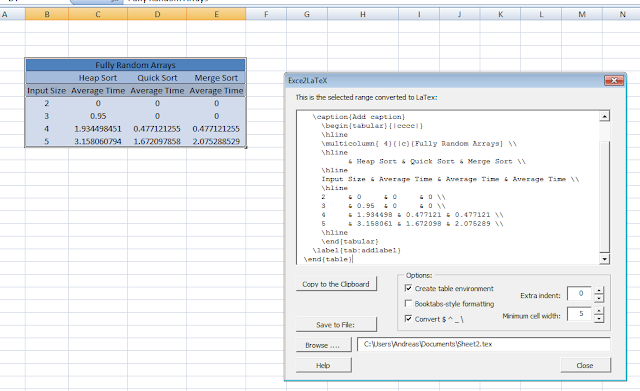 Creating a table in Microsoft Excel is far more easier than creating a table in LaTeX. Thus in this post, I will show you two ways on how you can convert the tables you produce in Excel to LaTeX format. 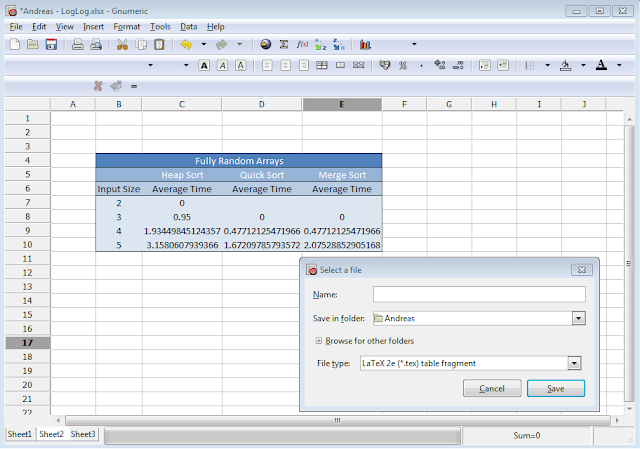 Download the excel2latex plugin from here. Once downloaded, double click on it and it will install itself as an Excel plugin. Note: I did encounter some very minor issues with the resultant LaTeX code from excel2latex, mainly when it came to rendering the outlines of certain tables. Gnumeric is another Spreadsheet application, but unlike Microsoft Excel, it supports the functionality of exporting spreadsheets to .tex format. Or you can save the whole spreadsheet as a complete LaTeX document, in which case it is probably an overkill for our current scenario of just rendering a single table. Why can you write arr[n] == n[arr] in C ? The above program prints out 1...ie, true. In the *(arr + 0) example, we are accessing the first element of the array by dereferencing the pointer to the first element arr plus the 0 offset. In the above example, we are accessing the second element with index 1. Therefore, if *(arr + 1) evaluates to arr, then surely *(1 + arr) evaluates to 1[arr] according to elementary math...because addition is commutative, which means that the order of the operands does not matter, as it produces the same result. Unfortunately, the only methods in Java that compute the logarithm of a number are java.lang.Math.log and java.lang.Math.log10. The former returns the natural logarithm (base e) of the number and the latter returns the base 10 logarithm of the number. Let's say we want to find the base 2 logarithm of 32 (method call would be logOfBase(2, 32)), which is 5. The following is a jQuery function I wrote that allows you to make a scrolling page title. The above snippet will use your existing title text to scroll. dir - "left" or "right"; by default, it's set to "left"